Wharfedale launches Diamond 11 Series at the Munich High End Show | What Hi-Fi? Wharfedale's revamped its latest range of bookshelf, floorstanding and home cinema speakers, with prices ranging from £150 to £1000. Wharfedale's latest additions to the world of bookshelf, floorstanding, and home cinema speakers have been unveiled in Munich. 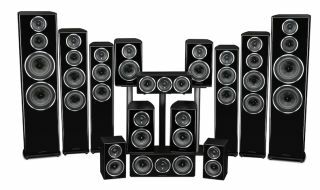 The Diamond 11 series comprises eight models: three standmounting speakers (Diamond 11.0, 11.1 and 11.2), three floorstanders (Diamond 11.3, 11.4 and 11.5) and two centre speakers for home cinema set-ups (Diamond 11.CC and 11.CS). And you'll immediately notice the change in the Diamonds' design - Wharfedale has returned to the curved cabinet sides from the Diamond 9 and 10 ranges that won Product of the Year Awards from us in 2005 and 2009. This is in an attempt to both avoid a boxy shape and reduce reverberation, and is helped by a new critical bracing and fibre lining to the inside of the cabinets. The drivers have been changed as well - bass and midrange drivers have a basket with a network of ribs for rigidity, "massive magnet designs to ... raise sensitivity”, and a newly evolved tweeter design. Pricewise, the home cinema centre speakers are the least expensive - the 11.CC and the 11.CS costing £150 and £230. The bookshelf Diamond 11.0, 11.1, and 11.2 speakers are £160, £270 and £350 respectively, while at the top end the floorstanding 11.3, 11.4, and 11.5 are £600, £800 and £1000. They'll all be available in July, in either black, white, walnut or rosewood.